Tomorrow, 24th November, is Loy Krathong (the date changes each year as it's based on the Lunar Calendar) - the festival is quite ancient and basically involves giving thanks for water, blessing the goddess of the water, and wishing for good luck. Looks like weather will be perfect - today has been sunny with blue skies, and tomorrow better be the same. I think we will head to the beach somewhere to float our family Krathong. My daughter had Loy Krathong activities at school today. Look out for new Loy Krathong photos on Jamie's Phuket blog sometime after tomorrow! I stopped at Chalong Temple today in the morning - very quiet in the morning before most visitors arrive. 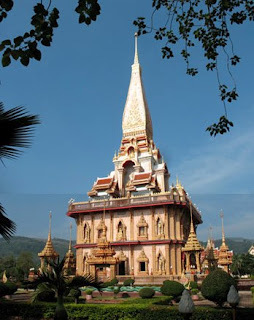 It's Phukets biggest and most visited temple.